Alright, Chrome browser users, here’s some good news from Google. The latest Chrome for Mac and Linux has been finally put into a stable beta mode and will be gradually rolled out to all Chrome for Mac and PC users. You know what it means when something comes out from being “unstable” to “stable” version, right? Well, it simply means that most often than not, the stable version is more reliable and has lesser bugs. Plus of course, tons of new features are also brought in. For both versions of Chrome for Mac and Linux browsers, these features come in bunch. Generally these new features include – browser preferences synchronization in addition to the previous bookmark synchronization feature. Browser preferences include themes, homepage and startup settings, web content settings, preferred languages and even page zoom settings. This means that once you’ve synchronized all these settings in one of your Chrome beta installation, you’d get the same settings in all your Chrome installations on various dekstop and laptops that you use. In addition, the new Chrome beta release also enables each Chrome extensions to work in incognito mode. You can set this up via the Chrome extension manager. The new Chrome beta release also incorporates HTML5 features including Geolocation API, App Cache, web sockets and file drag-and-drop. You may want to see how HTML5 function by browsing websites developed in HTML5 such as http://scribd.com. You can also try dragging and dropping attachments in Gmail or enabling geolocation in Google Maps. If you’re a Chrome for Mac user like me, you’d be glad to know that the latest version of Chrome beta now has full-screen mode and a powerful bookmark management feature. We’ve been wanting these features since Chrome for Mac was released and so the Google Chrome folks are finally giving it to us. 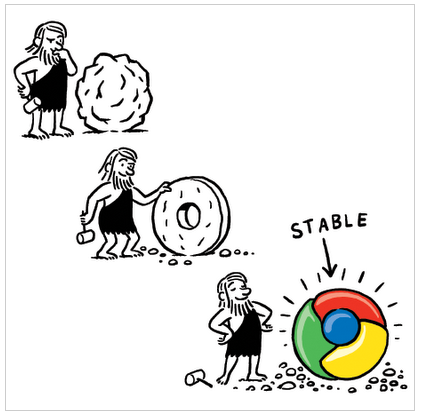 If you can’t wait for Chrome for Mac to be automatically updated, you may want to download it from this link.